Hiragana is the first of the three Japanese alphabets to learn. Hiragana is a phonetic alphabet, where each character represents a syllable. Hiragana is generally the first of the alphabets used, and is used for many purposes. Until one broadens their knowledge of kanji, they can use hiragana in place of the kanji they don’t know. Additionally, hiragana is used as particles, and is also used as accompanying characters to verbs, called okurigana. There are also some words that do not have kanji and are thus written in hiragana alone. Double Consonants: kk, pp, tt, etc. are expressed in hiragana as a small “tsu” (っ) before the kana. For example, chotto meaning “a little” is written as ちょっと. Katakana is the second phonetic Japanese alphabet. Katakana, unlike hiragana is written with straight lines. Generally, katakana is used for writing words of foreign origin. Double Consonants: kk, pp, tt, etc. are expressed in katakana as a small “tsu” (ッ) before the kana For example, shotto, meaning “shot” is written as ショット. There are small versions of “ア,” “イ,” “ウ,” “エ,” and “オ” that are “ァ,” “ィ,” “ゥ,” “ェ,” and “ォ.” These are used in conjunction with some other characters to create characters for sounds that were not originally covered by the original set of hiragana/katakana. Combining the small “ァ,” “ィ,” “ゥ,” “ェ,” and “ォ” with “フ,” gives character combinations “ファ,” “フィ,” “フェ,” and “フォ” for “fa,” “fi,” “fe,” and “fo” respectively. As the “v-“sound did not originally exist, the “ヴ” character was created to provide that sound. Now, “va,” “vi,” “vu,” “ve,” and “vo” can be written as “ヴァ,” “ヴィ,” “ヴ,” “ヴェ,” and “ヴォ” respectively. For “je,” “she,” and “che,” “ジェ,” “シェ,” and “チェ”are used for them respectively. Kanji: Kanji are the characters that were imported from China. Each kanji character generally has two readings – an onnyomi or音読み (おんよみ), which is the original Chinese reading of the character, and the kunnyomi or 訓読み (くんよみ), which is the Japanese adaptation of the character. Something to note is that characters can have more than one 音読み or 訓読み or both. Romaji: Romaji is the writing of Japanese phonetic characters as Roman letters. Sometimes it helps with pronunciation of words when learning Japanese. When Rosella told us she was preparing a guide to Calabria I have to say we were a bit intrigued. This is what I love about Pathport: discovering the stories of our pathfinders through their travels and learn about places that otherwise would have never crossed my mind. We asked Rosella to tell us a bit more about her relationship with Italy’s most unknown region. Can you tell us a bit about your relationship with Calabria? I was born and raised in Oppido Mamertina, a little village on Calabria’s Southern tip, set between the Aspromonte National Park and the Tyrrhenian sea (you can basically go sunbathe at the beach and hike in the mountains on the same day). Although quite unknown, it has an important archaeological site, Oppido Vecchia, which, in the past, attracted a lot of archaeologists from all over the world. I would say my ties with Calabria are quite strong – I go and visit quite frequently, not only because my family lives there, but because I still consider this place my actual home. It’s where I recharge my batteries and enjoy life at a slow pace, I binge on genuine food and, most importantly, I get to see blue sky (the most powerful remedy to stress, in my opinion). How would you explain that this part of Italy hasn’t been overrun by tourists yet? It’s quite simple: unlike any other regions (take Puglia, Sicily, Campania, just to name a few in Southern Italy) Calabria doesn’t have a good marketing strategy: its natural treasures and tourist attractions aren’t valued enough and local admins have quite a sluggish attitude when it comes to providing an adequate experience to travellers and tourists. If you had to point out one or 2 characteristics of this region, what would those be? What is different here? Calabria can be rough and wild, sometimes – a place of primordial beauty and deep contradictions. Life here is still very slow, especially in the little decadent villages that still retain a kind of charm and authenticity that no longer exist elsewhere. All in all I would say, beautiful and contradictory. What would a perfect day here look like for you, from morning til night? It’d begin with my favourite ritual: breakfast with cappuccino and croissant at one of the quaint bars scattered throughout my little town, Oppido, or the surrounding area. Then, off to the mountain for a refreshing walk in nature before enjoying a traditional lunch involving pasta and green beans (a typical dish we call ‘fagiolini’) deep-fried courgette flowers, fresh bread with nduja and a taste of deliesi – a super delicious dessert with vanilla sponge and cream. After this super ‘light’ meal, it’s time for another stroll – at the beach, perhaps. Where to? Tropea? Scilla? Chianalea? Bagnara? Ah, decisions decisions! At night, dinner alfresco by the sea (rigorously fish) and then a catch-up with friends over a good gelato. It’s basically just about enjoying those simple things you’ll never find in a place like London. And let’s not forget food! The is Italy after all. Any regional specialities people should try when going there? Where to begin? Calabria is such a huge region and each province has its own specialties. The common thing, however, is that Calabrian dishes are quite simple and ‘poor’, as they all come from a peasant cookery tradition. Anyway, I would recommend: nduja, a very spicy spread you can enjoy with bread, pasta, pizza, eggs, almost anything basically (well, not desserts, for example); pasta and green beans (fagiolini), a very poor yet extremely tasty dish; pitta, a two layered pizza filled with tomato, mozzarella, red pepper, anchovy, endive and black olives; tartufo di pizzo, a chocolate and hazelnut-flavoured gelato filled with melted chocolate, deliesi, a dessert made of two layers of vanilla sponge filled with white custard cream; and then, pignolata, torrone, soppressata, caciocavallo, dried cod, figs, licorice, olive oil and red wine galore (Cirò rosso, for example). The islands were once densely populated with endemic flora and fauna, but colonization over the years wiped out indigenous land mammals and most species original to the islands. European settlers introduced Cheviot sheep to the islands in the mid-1800s, and hunted the wolf-like warrahinto extinction. Today, while harboring nearly 3,000 people, the islands are still extremely biodiverse. For every permanent resident, there are 167 sheep. But about 65 species of birds—including albatrosses, caracaras, and penguins—can also be found on the islands, along with dolphins, porpoises, sea lions, and elephant seals in the surrounding ecosystem. The Falklands are often held up as a lesson in conservation, and how society and nature can peacefully coexist. For the February 2018 issue of National Geographic magazine, wildlife photographer Paul Nicklen traveled to the Falkland Islands to document this diverse ecosystem. National Geographic caught up with Nicklen, whose video of a starving polar bear wrenched thousands of hearts in December, to talk about his experiences in this remote habitat. How did you get the idea for this assignment? I’m always going to Antarctica, and [the Falklands] seems to be one of the major stopping grounds on the way. It always kind of frustrated me that we were just bypassing this place. We would get a glimpse of huge albatross colonies and an underwater world that was rich and diverse. There seems to be this balance of people, sheep, agriculture, fishing, and really abundant wildlife and nature. I really wanted to do a cross-section of this ecosystem that seemed so rich. Can you describe your experience at Steeple Jason? It’s a beautiful island. It’s long and narrow, four miles by one mile. Basically, you have two main peaks and a causeway in the middle, where all the penguins go and where the sea lions intercept them. It’s where the dolphins come in to play. On the long, tussock grass slopes are nesting some 200,000 [pairs of] black-browed albatross and tens of thousands of Gentoo penguins and rockhopper penguins. The more remote and untouched by man the island, the richer they were. AFTER YEARS OF WAR, NATURE IS FLOURISHING ON THESE TINY ISLANDS In the Falkland Islands, the resiliency of nature is everywhere. Do you have a favorite photo from this assignment? I think the lead image. I was sitting there in awe, photographing, with beautiful light, storms in the distance, looking at tens of thousands of perfectly spaced black-browed albatrosses on their home-made nests and their partners were soaring through the air. And this bird with a seven, eight-foot wingspan comes in, floating behind me on the wind and taps me on the back of the head as it soars over me. And that’s the one that you see, the lead image of the wings framing the colony. I felt that image summarizes a place that wouldn’t be protected [without the action of a few conservationists]. Animals there are not used to human disturbance and seemed very relaxed around me. They let me into their world. I got to witness this abundance and this symphony of life scratching out a living. Realizing that it’s not just doing well but it’s thriving, because of protection. It was like being in the middle of a really intense scientific experiment. On islands that had thousands of sheep I would find almost no nesting habitats, birds, or native animals. At another place, where one person invested in wild habitats, protected it, and got rid of all the sheep and [invasive] rats, we watched [the wildlife] explode. I realized how resilient nature is, how badly it wants to come back. Four billion years of evolutionary process created these masterpieces in nature. It’s just amazing. Are you optimistic for the future of the Falkland Islands? You can protect a place like Steeple Jason and have the wildlife thrive and if there’s no fishing around it, then the marine ecosystem thrives, but you think of one massive oil spill and you realize that that stuff can be destroyed. We have tens of thousands of birds flying offshore feeding, and ultimately, when you think about the plastics coming down on the ocean currents you realize no place is ultimately safe. You realize how perfect and beautiful it is but also, still, how vulnerable it is with other forces outside of the islands themselves. It felt like I was going back to my childhood of being immersed in wild habitat, just to be alone on this island with nature like that. I’ve always believed that Heaven is here and now. We’re so busy in our lives with our phones and computers and we’re dreaming of an afterlife of where we’re going to go next, but we are living in Heaven. It doesn’t get any better than that—this is it for me. And we’re killing it. But being [in the Falklands] really lifted my spirits. It gave me hope that places will recover if we can just get out of the way. This interview was edited for length and clarity. It has been updated with a few small changes to better clarify the location of predators and number of birds on the islands. Storicamente le persone mancine non hanno ricevuto sempre un buon trattamento. Sono state perseguitateper la loro disposizione, etichettate come cattive, addirittura come streghe, nonostante rappresentino il 10% della popolazione. Pensate al significato della parola “sinistro”. 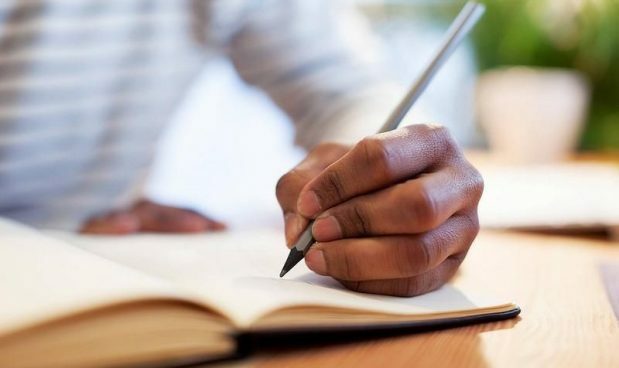 Nel corso dei decenni sono emerse alcune teorie sul perché alcune persone siano mancine, tra cui un’idea superata che chiama in causa lo stress materno durante la gravidanza. A partire dagli anni Ottanta, la ricerca ha scoperto che la nostra preferenza per la mano destra o sinistra è determinata più probabilmente prima della nascita. Screening con gli ultrasuoni stimano già dall’ottava settimana della gravidanza. Dalla tredicesima settimana all’interno dell’utero i bambini tendono a succhiare il pollice sia della mano destra sia della sinistra. Una volta si pensava che le differenze genetiche tra gli emisferi destro e sinistro del cervello determinassero destrismo o mancinismo. Ma uno studio pubblicato l’anno scorso sulla rivista scientifica eLife ha scoperto che la risposta potrebbe risiedere nel midollo spinale. La ricerca, condotta da Sebastian Ocklenburg, Judith Schmitz e Onur Gunturkun dell’Università della Ruhr a Bochum (Germania), insieme ad altri colleghi olandesi e sudafricani, ha scoperto che l’attività dei geni nel midollo spinale era asimmetrica nell’utero e poteva essere la causa del perché una persona sia destra o mancina. I movimenti del braccio e della mano nascono nel cervello, in un’area definita “corteccia motoria” che invia un segnale al midollo spinale poi tradotto in movimento. I ricercatori hanno scoperto che mentre il feto cresce nell’utero, fino a circa 15 settimane, la corteccia motoria e il midollo spinale non sono ancora collegati, ma il destrismo e il mancinismo sono stati già determinati. In altre parole, il bambino può già iniziare a muoversi esceglie una mano preferita prima che il cervello inizi a controllare il corpo. Per studiare questo fatto, i ricercatori hanno analizzato l’espressione genica nel midollo spinale dall’ottava alla dodicesima settimana di gravidanza. Hanno scoperto differenze significative nei segmenti sinistro e destro del midollo spinale che controlla il movimento del braccio e della mano. Hanno quindi concluso che la natura asimmetrica del midollo spinale potesse dipendere da qualcosa chiamato epigenetica, o il modo in cui gli organismi sono influenzati dalle variazioni presenti nella loro espressione genica piuttosto che nei geni stessi. Questi cambiamenti sono spesso provocati da influenze ambientali e possono influenzare la crescita del bambino. Queste differenze nell’espressione genica potrebbero interessare in modo diverso le parti destre e sinistre del midollo spinale, traducendosi in individui mancini o destri. Leggi anche: Ho fatto i test genetici AncestryDNA e 23andMe: volete sapere qual è il migliore? Allora perché i mancini sono così rari? La domanda assilla da tempo i ricercatori. Nel 2012 i ricercatori della Northwestern University svilupparono un modello matematico per mostrare come la percentuale di mancini fosse il risultato dell’evoluzione umana — in particolare, un equilibrio tra cooperazione e competizione. In altre parole, hanno pensato che, anche se il fondamento del destrismo o del mancinismo può essere genetico, potrebbe esistere un fattore sociale che spiega come mai il rapporto è così sbilanciato. “Più l’animale è sociale e ha una maggiore considerazione della cooperazione, più la popolazione generale tenderà verso un lato”, ha dichiarato a LiveScience Daniel Abrams, assistente alla McCormick School of Engineering and Applied Science che ha contribuito allo sviluppo del modello. “Il fattore più importante per una società efficiente è rappresentato da un elevato grado di cooperazione”, ha aggiunto. “Negli esseri umani ciò ha portato a una maggioranza di destri”. Per cui, per qualche motivo, potremmo esserci evoluti favorendo il destrismo e facendo sì che chiunque deviasse da questa tendenza fosse condizionato a usare principalmente quella mano nonostante la propria disposizione genetica. In effetti, Judith Schmitz, una degli autori del nuovo studio, ha detto a Business Insider che studi sui gemelli hanno dimostrato che il contributo della genetica alla preferenza della mano è di circa il 25%. Il nuovo studio non è riuscito a spiegare la maggioranza del destrismo, ma Schmitz ha spiegato come la ricerca ornitologica riesca a mostrare in che modo genetica e ambiente possano essere la causa. “Nei polli e nei piccioni un fattore genetico determina la posizione all’interno dell’uovo prima che si schiuda — l’embrione è raggomitolato in modo che l’occhio destro sia rivolto verso il guscio semi-trasparente, mentre quello sinistro è coperto dal corpo dell’embrione stesso”, ha detto. “Quindi, l’occhio destro è stimolato dalla luce prima della schiusa, mentre il sinistro è perlopiù privato di luce. Questa combinazione di fattori genetici e ambientali (luce) provoca una visuale asimmetrica — piccioni e polli posseggono una discriminazione e una categorizzazione visive e una memorizzazione di pattern visivi migliori con l’occhio destro rispetto al sinistro. Se le uova di gallina o di piccione vengono incubate al buio, si previene lo sviluppo di tale asimmetria”. Le cause del mancinismo hanno ancora del misterioso – in parte, dicono gli esperti, perché i mancini vengono spesso esclusi dalle ricerche scientifiche – ed è difficile prevedere se un bambino nascerà destro o mancino. Di una cosa siamo, però, sicuri: le differenze neurologiche tra destri e mancini sono minori, mentre le supposte distinzioni comportamentali e psicologiche sono state ampiamente smentite. This article explains Da Vinci’s scientific method, how it related to the cultural and scientific climate of the time, and some of the key scientific discoveries that it generated. What was Da Vinci’s Scientific Method? Da Vinci is often described as being a true Renaissance polymath: that is, a person who wishes to understand all branches of knowledge. As such, Da Vinci is likely to have viewed scientific research as a complement to his researches in art and languages as well as to the study of theology. In short, science in his world view was probably one of several branches of knowledge that he wishes to master in order to achieve a well rounded education. Da Vinci’s scientific method consisted of a mix of observation of the world around him and the physical experimentation with, and construction of, new inventions, aided by preliminary sketches. Though his hunger for all types of new knowledge and discovery planted him firmly at the heart of what many consider to be Renaissance values, in another way Da Vinci was something of an unconventional scientist. This is because, despite the fact that university culture was flourishing in Italy during his life time, he never attended a university (and thus had no formal education in mathematics, despite being a great mathematician). It could be argued that this lack of a formal structure to his education is precisely what enabled Da Vinci to be such a free thinker and such a good scientist. Da Vinci’s scientific interests, inventions and experiments spread out vastly into numerous different areas of science. Not only was he interested in chemistry and geology but also in astronomy, pyrotechnics, biology (or zoology), human and animal anatomy and mechanical engineering. Da Vinci’s scientific endeavours were so ahead of his time that he has anticipated many devices that we consider to be ‘modern’. Two key examples of this are the calculator and solar panels for generating electricity. Now, let’s take a look at a few of Leonardo Da Vinci’s key scientific inventions and findings. This is most certainly not an exhaustive list of his scientific achievements but is more just to give a flavour of the types of scientific work that he applied himself to. Da Vinci made many detailed drawings of both human and animal anatomy. His famous drawing of the Vitruvian Man is an example of his interest in the proportions of the human body. This drawing is a good example of how several of Da Vinci’s scientific works could also be considered works of art. There is no doubt that Da Vinci’s in depth knowledge of the human anatomy beneath the skin enabled him to create such dynamic and realistic portraits of human beings in his paintings. 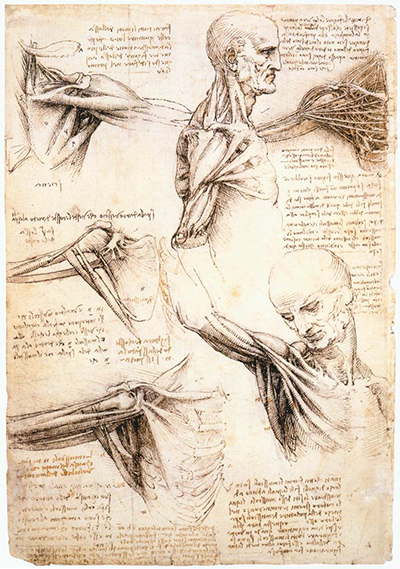 Da Vinci produced numerous anatomical studies in his sketchbooks, and it is clear from them that he was very interested in the relationship between skeletal muscle and movement. He writes in one journal of discovering how pulling gently on a single muscle fibre can make a cadaver’s whole arm, move, for instance. Gestation was another topic that keenly excited Da Vinci’s medical mind: he studied the way in which the foetus develops in the womb in such detail that his drawings remained useful for several centuries afterwards. Finally, Da Vinci also had a significant interest in comparative anatomy. That is to say, he was interested in comparing the anatomical make up with human beings to those of other animals (especially horses). This interest in comparative anatomy, combined with Da Vinci’s studies of fossils, may have led him to hit upon a rudimentary theory of evolution. However, it would very likely have been considered a heresy had he published this theory or spoken about it in public, so it is likely that if he did formulate such a theory that he was likely to have kept his ideas to himself. Galileo Galilei, another important early modern scientist, was captured, tortured and condemned by the Roman Inquisition for stating his scientific belief in a heliocentric solar system (i.e. a solar system where the earth and planets orbit the sun rather than – as was thought at the time – the sun orbiting the earth). Da Vinci traced his interest in geology back to a powerful childhood memory that he had of entering a cave near where he was living and seeing, by torchlight, bands of different fossils in the rock. This suggested to him that at one time the cave – which was high up in the Apennine Mountains – was once below sea level. Leonardo studied the way in which sedimentary rock was formed and this led him to dismiss the notion that it was Noah’s Great Flood that caused the sea shells to be thrown up into the mountains. However, because these ideas would be very likely to have been considered heretical at the time as they were contrary to the Bible’s teachings, it is possible that Da Vinci was dissuaded from pursuing or publishing any further formal studies in geology. As a young man, Da Vinci used to construct numerous different objects thanks to an uncle who taught him how. Da Vinci thus made a very good self taught civil engineer. He constructed several inventions that were deemed to be very useful by the state of the time, including bridges and several catapults. One significant aspect of his studies in civil engineering involved hydrodynamics. Da Vinci created several machines that were designed to control the flow of water, including a corkscrew shaped contraption (based on ancient Roman hydraulic systems) that was able to move water in a vertically upward direction. From his perpetual motion machine to his theories about the relationship between light and opaque bodies, Da Vinci’s scientific discoveries are all totally fascinating. He used his geometrical investigations to understand more about perspective (and subsequently applied this knowledge in his works of art), for instance, whilst his love of flowers and plants led him to study and to sketch the makeup of trees and flowers with as much skill and dedication as he devoted to the inner workings of the human body. He came to some surprising conclusions, here. For example, he wrote as if it was an axiom that if at any point during a tree’s life you measured the thicknesses of all of its branches (excluding the central trunk) and added those thicknesses together, the final value would equal the value for the thickness of the trunk itself. Da Vinci’s plethora of sketch books and journals are a window onto his scientific mind. Usually, Da Vinci wrote in his journals and annotated his scientific diagrams with mirror writing (i.e. writing that could be read by placing a mirror up against the page). He also published one scientific work. This was a mathematical treatise on proportion which was published in 1509. Da Vinci co wrote it with one of his friends, the mathematician Luca Pacioli, and it was entitled De divina proportione. Many of Da Vinci’s scientific discoveries were not made manifest by means of the printed word, however, but by practical demonstrations. He loved to create models as well as life size working inventions of his bridges, catapults and other war machines. He also worked physically with lenses and other optical devices. Da Vinci also claimed to have created a formula for a perpetual motion machine. This is a machine that stays in motion once it has been started, without any need for a further supply of energy and without losing any energy or momentum due to friction or air resistance. To this day, scientists and engineers would love to know how to create a highly energy efficient machine such as this one. However, thus far, this has been one of Da Vinci’s discoveries (assuming that he truly had concocted a way to make such as machine) that continues to elude the minds of modern scientists. Da Vinci’s work within this field would advance his paintings and drawings, as well as vice versa. The other Renaissance masters of Raphael and Michelangelo would also specialise more in some mediums than others. 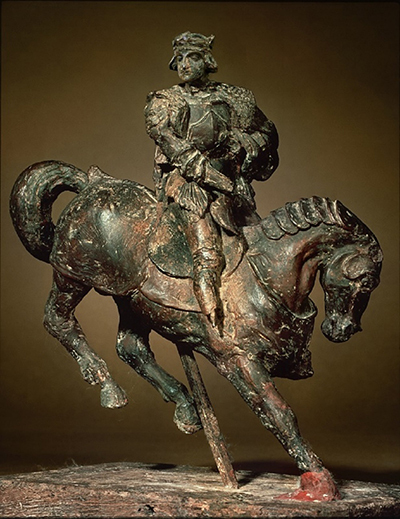 Leonardo devoted much of his time to preparatory sketches for two specific sculptural artworks, namely his bronze equestrian statue for Francesco Sforza and also a monument for Marshal Trivulzio. Neither of these two projects would ever be completed, due to a number of different reasons. The deep level of planning that Da Vinci would go into for these planned pieces is underlined by how he would even design the vehicles that would carry the completed works to their final display positions. We are left contemplating what might have been with his work in this genre, causing most focus to remain in the present day on his paintings and drawings. There is also continued discussion of what legacy may have been left had these sculptures been completed, but most art historians agree that they would be unlikely to have achieved the same academic respect as Michelangelo’s Pieta and David, for example. Most feel this was not his strongest discipline. With no completed sculptures to display, this section outlines the series of study sketches that he completed for the Sforza and Trivulzio monuments as well as describing how other, more recent artists, have taken inspiration from his career in order to produce their own sculptures. Besides the monuments found here, Leonardo da Vinci would continue to use horses in much of his work. He found these animals enchanting and beautiful, perfectly suited to his style and qualities as an artist. There is also a strong crossover between his work on the human anatomy and his studies of the horses found here. Aside from his own contributions to this medium, many others have also taken on his work to create their own inspired pieces. In the field of sculpture, Leonardo actually planned a number of sculptures before his demise. Sadly, he was unable to action many of them into final sculptures. Some of those inspired by his own drawings and designs included Gran Cavallo (Horse in Bronze), Il Cavallo (the American Horse), Vitruvian Man Wall Sculpture and the Annunciation. Though he didn’t do many monuments, a number of sculptures inspired by his paintings and life are available in the markets. They include Mona Lisa Bronze Sculpture, the Last Supper Sculpture, and Da Vinci Bust Sculpture. 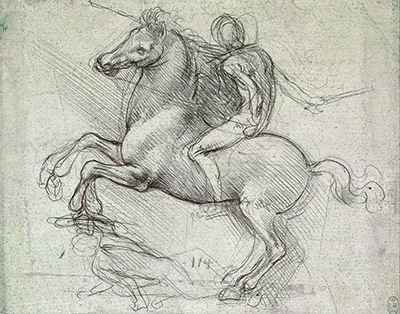 In 1842, Leonardo was requested by the Duke of Milan to make a horse sculpture. The artwork was to honour the Duke’s father, and it was to be placed in front of the castle. 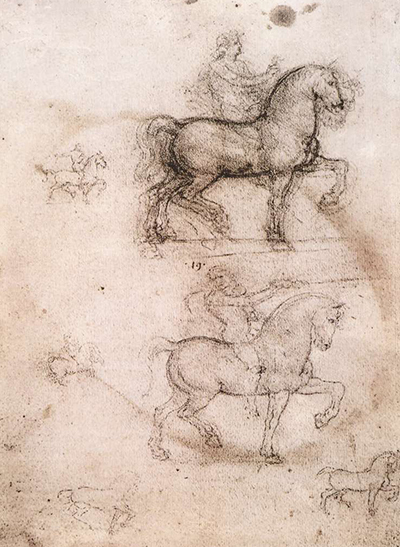 Da Vinci managed to sketch the biggest ever horse sculpture that was supposed to be coated with bronze later on. His sketch plan was appreciated by the Duke, and he couldn’t wait to see the real thing. During this time, France was a threat to Italy and bronze was used in building canons employed in protecting Milan. This halted the sculpture work as bronze was limited, and the artefact could not be completed. There was fear throughout Milan and Leonardo could not wait to concentrate and complete the work. Considering that the French military was dominant over Milan, he fled the city and went back to his hometown of Florence for refuge and he never got back to Milan to complete the piece. It took many years before anyone considered to complete the work. Centuries later after his demise, the sketches made by Leonardo surfaced and presented an opportunity for someone to pick from where he had left. An American pilot became inspired by Leonardo’s work and founded a nonprofit firm named after Leonardo to complete the sculpture. In 1999, the effort of this organisation paid off and the biggest horse sculpture was unveiled in Milan. It was 24 ft high and cast in bronze and it got everyone surprised and impressed at the same time. A month later, the second sculpture was uncovered in Michigan. These two marked the revival of Da Vinci’s famous Gran Cavallo sculpture. Today, there are many pieces in major galleries and online stores. It is available in different sizes and from different countries. 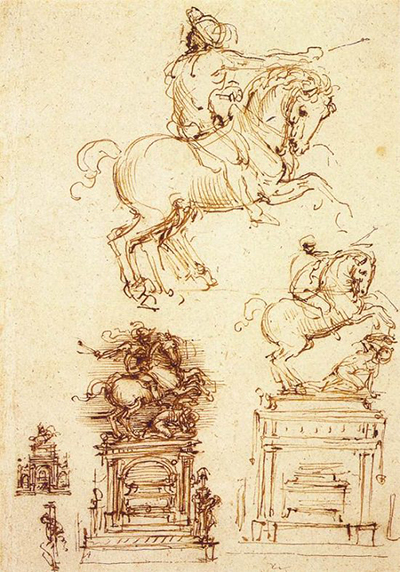 In 1506, Da Vinci made a sketch of horse sculpture, similar to the one he did in 1842 for the Duke of Milan. The horse sculpture named Il Cavallo was dedicated to Giacomo Trivalzo. However, the artwork never got much attention at the time. In making this monument, Leonardo faced two major challenges. One, he needed to work on the belly space of the horse. Space on the belly was supposed to be filled. Secondly, Leonardo wanted to occupy the rider’s space. The rider was to be designed separately and placed on the horse. Following his demise, a number of sculptors have taken the challenge to deliver a complete sculpture based on Leonardo’s sketch and design. There are a few variations in design but the original details are maintained. Today, a number of sculptures are available in the memory of Leonardo. The statute is normally procured to present an artistic appeal to homes and social halls. The display of the masterpiece promotes creativity and inspiration in a place. The image is of great beauty and amazement to the procurer. For those who are Da Vinci fans and to those who just appreciate art, the sculpture is highly rated by them and they consider it as one of the greatest sculptural work. With many designs available in the market from different nationalities, more enhanced sculptures of the design are expected each day. The art industry is growing and sculptors are getting inspired especially by pioneers such as Da Vinci. For this reason, the Il Cavallo is an expression of better things to come. This sculpture is of historic importance. The wall sculpture is cast in high-quality resin and stone finishing. Initially, the Vitruvian Man was sketched by Leonardo as a painting and sculpture. Due to the fame that the sculpture sketch and painting gained over years, more statutes have been made of it. The pieces are available in different designs and sizes. The finishing also varies based on the preference of the artist. The available options include wood carving, bronze, and stone. The display of the wall sculpture is significantly historical. The design is a representation of the great art mastery by the Italian Leonardo. Today, many art enthusiasts rate this sculpture as one of the best historic statutes inspired by him. It is a representation of style and essence in the art field. The display of this historic piece gives the room an appeal of beauty and class. The existence of different designs and sizes make it convenient to be placed in any room. It can be put in museums and homes to display class and enhance beautiful room presence. The painting is appealing to all class of art enthusiasts. The Vitruvian continues to amaze and astound many art fans. The hype to deliver more enhanced wall sculpture is high and the market can only expect more of the Leonardo inspired Vitruvian Wall statute. This piece of work has a similar appearance to the original painting but it’s slightly different in the finishing. It’s made of high-quality resin with a glossy finishing. Accompanying the package is a colour card that is written in 4 different languages. The artwork just looks amazing considering the historic and biblical significance behind the idea. It is a display of the biblical story about the birth Christ. The message was announced by Angel Gabriel to Mary about her becoming the mother of Christ. Biblically, the annunciation of the birth of Christ is symbolic. It signifies the possibility of human salvation. Christians celebrate the birth of Christ during Christmas each year and so such sculpture adds relevance to the occasion. The messenger who in this case is angel Gabriel is clearly sculptured to appeal the message of hope to the believers. The annunciation was met by disbelief initially from Mary and this is clearly expressed in the statute. For Christians around the globe, the sculpture is very important as it highlights descriptively the contents of the Bible. The sculpture is also historically significant as it outlines a piece that was carefully designed and crafted. The appeal gives an understanding to the art fan of the actual historical event. The artefact is a wonderful piece to put in a home or social setting. It is also displayed in museums and churches as a constant reminder of hope of humanity. For those who find it hard to read the Bible, they get to look at the sculpture as a constant reminder of hope. The Da Vinci Annunciation sculpture is of great essence to the current art world and the future ones. This sculpture is specifically designed in reference to Da Vinci’s mastery of the art of painting. He was referred to as the Renaissance Man. The sculpture has a bronze finishing and the artwork measures about 9 inches high. It has a Bulgarian origin. The piece is an upper body image of Leonardo Da Vinci. It is designed to honour Da Vinci. Historically, the Italian art legend has been instrumental in the art industry. His famous paintings are a motivation to many artists. Having a statute image of him is an illustration of the achievement that this great artist managed. The statute is well designed and crafted to appeal the message intended. With Da Vinci’s name engraved at the bottom of the statute, the piece is worth a purchase. The bust statute is available in different carvings such as bronze, wood, and stone. 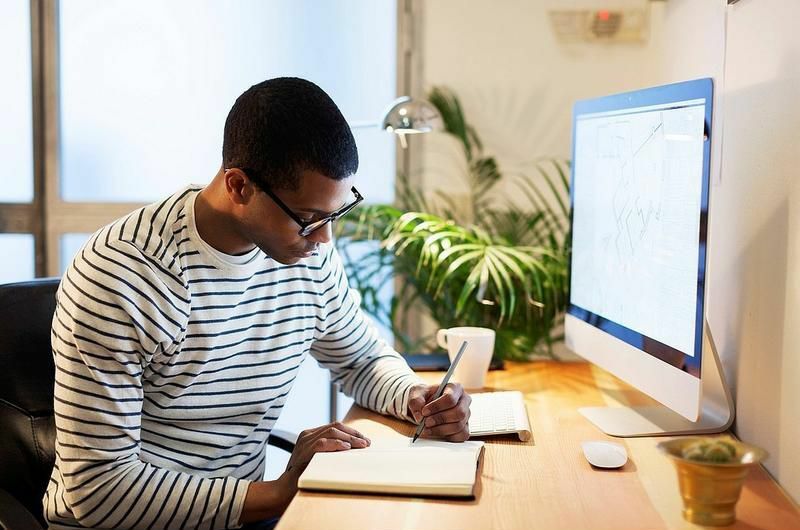 The nature of material design dictates the market price and the cost may vary from store to store depending on the nature of material, design, and size of the piece. The powerful stand makes it suitable for any platform ranging from homes to art galleries. This sculpture is a motivation from Da Vinci’s famous painting, The Last Supper. The piece is an artistic expression of the events recorded in the Bible that involves Jesus and his disciples taking the last meal. This was before Christ’s eventual death sentencing. During the last supper, Jesus happens to reveal to his disciples that one of them will betray him. The sculpture gives a detailed artistic feel of the actual event. The artistic appeal is more illustrative of the actual biblical event. The piece is most convenient for churches and homes. Even those who are not Christians get to procure it because of its historic and biblical essence. The piece not only displays creativity by the artist but also inspiration considering the reference of the work. Da Vinci’s level of creativity is evident in this particular piece and one would just agape at the wonderful sculpture. The painting can be procured for many reasons but what is peculiar is the level of creativity in the piece. Most of the pieces are from Germany. The sculpture is found in bronze, wood, and clay carvings. This is also inspired by Da Vinci’s famous painting Mona Lisa. Most of the pieces are from the US. The painting was done around 1503 and 1519, and it acts as an artistic reference to sculptures today. The statute gives a detailed feel of the original painting. It displays a partial body of a woman (Mona Lisa). There is so much artistic touch interpreted on the statute. Her smile is an expression of Da Vinci’s cosmic idea of linking humanity and nature. The bronze sculpture is mounted on a firm solid base and it measures 12 inches in length. According to researchers, the woman on the sculpture is believed to be Lisa Gherardini. Many art enthusiasts rate this sculpture highly and the reason is that of its historic importance. The appeal of the statute is also illustrative of the message intended by the Da Vinci. The statute gives an alternative artistic feel to the painting. A dominant artistic presence develops when the sculpture is around. The ambiance surrounding the figure is very inspirational from the artist’s point of view.